Despite all the wonderful color images we have from the Hubble space telescope, there is no color camera on the Hubble. The main reason for this is scientific. When observing astronomical objects, you’d like to get as much light as you can from the object. You also want to get as wide a range of wavelengths as you can. The light detectors used in space telescopes are typically charged coupled devices or CCDs. When light hits a pixel in a CCD it induces a charge. The more photons that strike a pixel, the more charge you get. In this way you can measure the brightness by the amount of charge you get. A similar digital camera is known as CMOS sensor. These are typically used in cell phones and the like since they are inexpensive, but they tend to have less sensitivity. To make a color digital camera, you have to put a layer of filters over the sensor so that a third of the pixels will only see red light, a third only green and a third only blue. This is similar to the way the cones in our eyes work. They are sensitive at red, green or blue, and our brain puts this information together to produce our color vision. In your cell phone, the red, green and blue pixels are put together to make a color image. This is fine if all you want to do is put photos of your cat on Instagram, but all those filters block a portion of the light, which produces a darker image. Since the filter is built into the camera, this also means you can only take a color picture. This means you have no flexibility to image things at any other wavelengths. So for most telescopes the CCD just measures brightness within the range of their sensitivity. For the Hubble’s Wide Field and Planetary Camera (WFPC) this ranges from infrared through the visible to ultraviolet. The Hubble then has filters that can be moved in front of the camera. So if you just want to look at infrared, there is a filter that lets you do that. 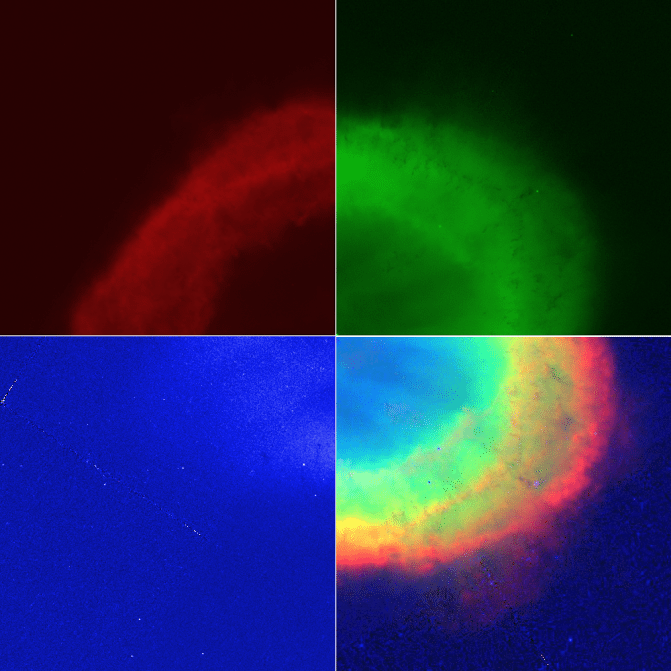 So if telescope cameras typically only see in shades of gray, how do we get all these wonderful color images? They are composite images made from grayscale images taken under a red, green and blue filter. These three images are then given the appropriate color, and layered to produce a color image. You can see this in the image above, where I’ve colorized the original filtered grayscales from the Hubble to produce a color image of the planetary nebula M57. My result is pretty basic. To produce the truly magnificent color images you see takes a tremendous amount of skill and talent. Of course since these images are composites you can also create false-color images of objects taken in infrared, ultraviolet, radio and x-rays, none of which have color to our eyes. Color images are not only beautiful, they serve to inspire us to understand and appreciate the universe around us. But astronomers find shades of gray much more useful. about myself.i’m ronnie, i perform a craft called paintless dent repair.in our craft we use what are called fog boards, and fog lights.these are basically a piece of plastic with a black line painted down the middle of both board, and light cover.i’m taking a shot in the dark here with a question for those who might know. my question is how much more shades of gray could we see if we were using a camera lens rather than our naked eyes?i know humans see about 30 shades of gray.